Cells and subcellular structures experience forces from a variety of sources. In general, forces are developed from within the cell via the cytoskeleton (endogenous forces) or come from outside the cell (applied forces). 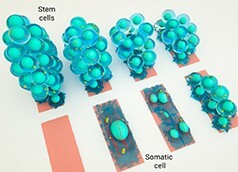 Forces exerted on the cell are often dynamic in nature, requiring the cell to constantly re-evaluate its status and adjust its internal and external morphology accordingly. Although the mechanosensors and mechanotransduction events occur locally at the cell periphery, the forces and biochemical signals are transmitted throughout the cell ,,, and are integrated over time ,. In general, they promote stiffening, softening and reorientation of cytoskeletal filaments ,,. 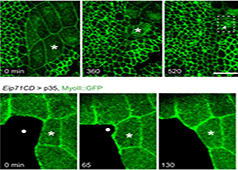 This results in strengthening of the entire contractile machinery without disturbing cellular connectivity (reviewed in ). 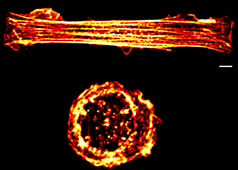 Each of the three filament types that constitute the internal cytoskeleton, e.g., actin filaments (shown in red), microtubules (shown in yellow), and intermediate filaments (shown in blue-gray), are interlinked in a state of resting tension throughout the cell, to other cells, and to the ECM. 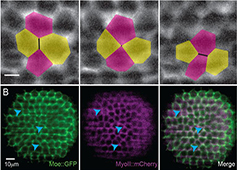 During cytoskeletal assembly, the filament subunits encounter intermolecular bonding forces that attract (pulls or tenses) its neighboring subunits. These forces are counterbalanced by intramolecular resistance against being compressed. The stiff and flexible regions present in most components and associated proteins endow filaments with elasticity and ‘pre-stresses’ the entire system to resist deforming forces such as extension, bending and compression (reviewed in ). In non-muscle cells, contractile resistance to deformation (upon force/ stress application) is provided by the actomyosin machinery. 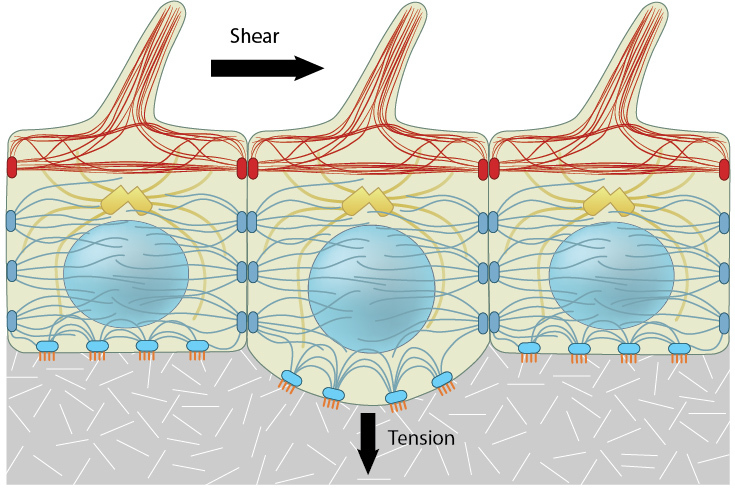 This machinery generates tensional forces by remodeling and exerts traction forces on cell-cell and cell-matrix adhesions (strain), thereby creating a resting tension within the cell (reviewed in ) (See ‘Figure: Contractile machinery provides resistance to deformation’ below). 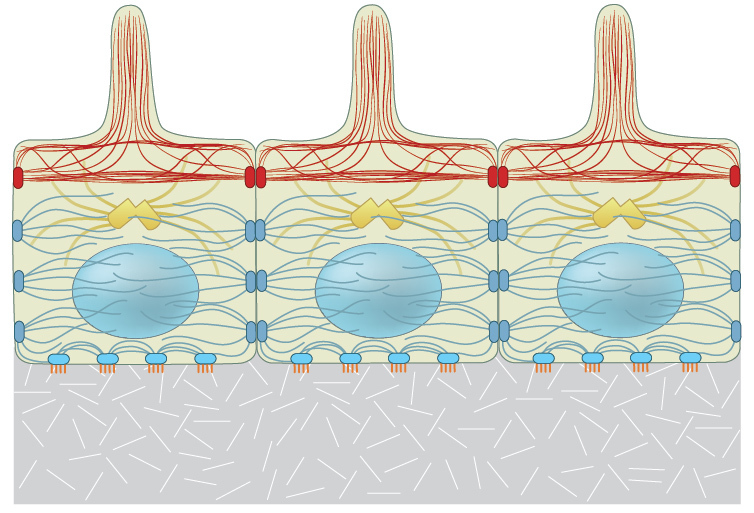 This contractile tension is representative of the feedback system that a cell uses to couple external and internal mechanotransduction events (reviewed in ). Variation in the stress vs. strain homeostasis can influence which of the different mechanosensors work together to orchestrate a concerted response and governs how the signal is integrated ,. External forces experienced by cells and tissues include tension, compression, shear, swelling and membrane curvature. Resilient and pre-stressed, the contractile machinery immediately responds to micrometric and nanometric variations in the geometry, topography or spatial distribution of their environment ,,,,,. Applied forces (such as shear stress or tension) are detected by mechanosensors located near the cell surface where the stress is applied. 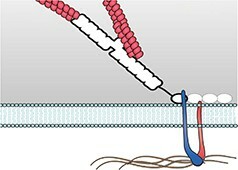 The resulting force-induced conformational changes on the mechanosensory molecules is transmitted throughout the interlinked cytoskeletal system and is focused onto other mechanosensors within the network. A concerted global mechanoresponse to the applied force(s) can influence gene expression not only through direct signal transduction pathways, but also through force transmission through the cytoskeletal elements and interlinked nuclear membrane. 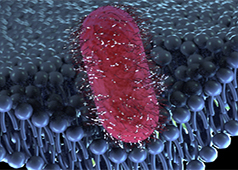 Forces applied at the macroscale cause a change in the strength of cell-cell or cell-matrix associations. This activates mechanosensors and signals down through the cellular network via the cell membrane, adhesion receptors and focal adhesions. 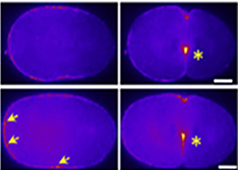 Specific pathways focus the force onto protein complexes that comprise functional modules . 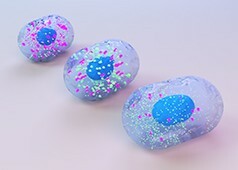 These mechanotransduction events allow the cell to distinguish the chemical nature  and stiffness of the underlying surface , as well as specific types of extracellular matrix (ECM) fibers . These factors influence the downstream signaling and cytoskeletal events that lead to altered cell morphology . Strengthening of the contractile machinery in response to an external mechanical force, ultimately creates an opposite force within the ECM. This leads to ECM remodeling to regain homeostasis and reinforcement of adhesions to resist higher forces . This process therefore creates a feedback loop within the mechano-sensing and -transduction system. 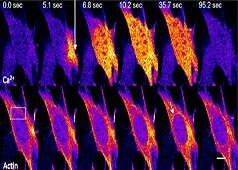 Certain components of the cytoskeleton, namely the microtubules and actin filaments, bear compressive forces to counterbalance the tensile forces in the pre-stressed elements. Other elements, namely intermediate filaments, are necessary for long force transfer through the cytoplasm and for structural integration of the cytoplasm and nucleus (reviewed in ,,).